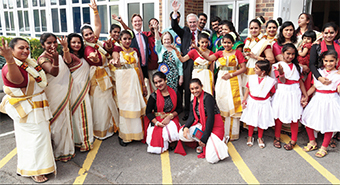 A SHEERWATER school was a blaze of brilliant colour and amazing music on Saturday when the Woking Malayalee Association hosted their second Union of UK Malayalee Associations’ Family Festival. The national event was inaugurated at the Bishop David Brown School by the borough’s Mayor Tony Branagan. Among the guests were his Mayoress wife Mary, Woking MP Jonathan Lord, popular Malayalam movie director Boban Samuel, UUKMA National President Viji KP, National General Secretary Binsu John and founder UUKMA President of Varghese John (Sunny) . Kicking off to the rhythm of the chenda melam drums, played by Joel Joseph and Shinto, traditional dress formed the backdrop of the colourful event. An assortment of dances and various art forms from across the state of Kerala in south west India was the staple for the day. 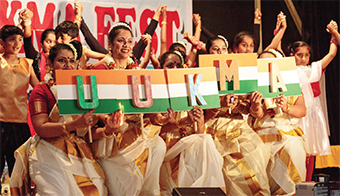 Kerala, also called God’s Own Country, is known for its rich and vibrant dance and art forms. 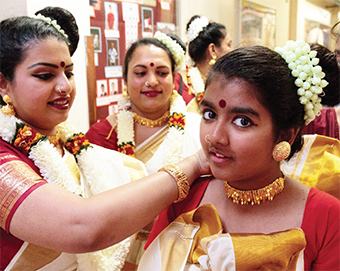 Participants included winners of last year’s National Kalamela (cultural competitions) held in Liverpool. 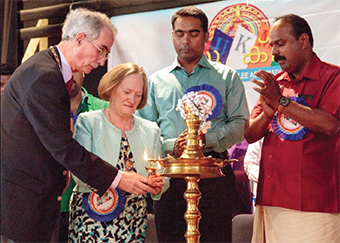 The Woking Malayalee Association also launched their annual souvenir magazine during the event, which was attended by more than 350 members of Malayalee organisations across the country. It was covered by popular Malayalam channel, Anand TV. Committee member Suhas Hydros said: “It was very colourful. The best thing was that it was attended by people from all over the country.